Shacharit and weight training. Finding creative ways to daven. I have generally believed in the concept of mind, body and spirit; and when the three are connected life is pretty good. This year I have been challenged around the concept of prayer. My main problem was, how to fit it in, so I didn’t. It bothered me that I did not have a spiritual practice. After a discussion with my spiritual director she reminded me that I do indeed have a spiritual practice. My main spiritual practice has always been fitness: lifting weights, biking, running, walking, etc. I lift weights at least four times a week and bike to school almost everyday. This is my spiritual practice. With that said it started to become more important to me to incorporate traditional davening into my life. Today, I incorporated Shacharit into my weight training routine and I have said modeh ani, the morning blessings and the Shema while biking to school. By incorporating prayer into my fitness routine I can make time; time to thank God, and time for self reflection. Like many people in today’s society, I have a crazy busy schedule and it is hard to find time for traditional davenning. By incorporating prayer into my fitness routine I can make time. 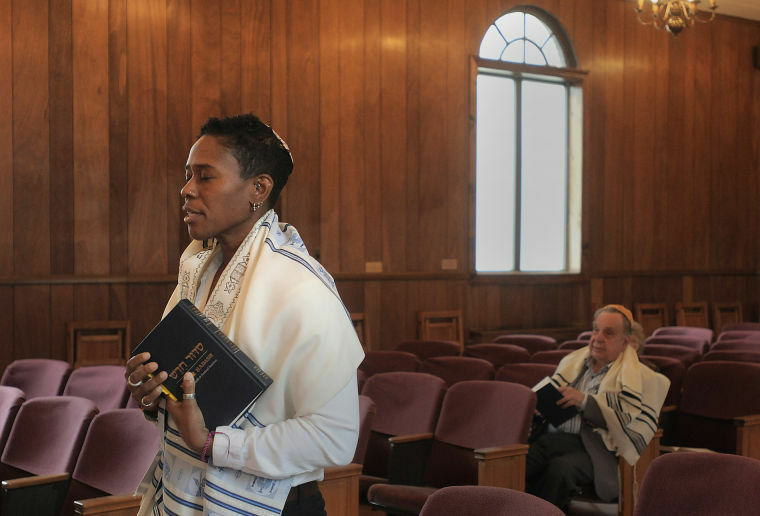 Today, Jews need to find creative ways to pray. We need to be freed from our traditional concepts of connecting with the Divine. The harder we make prayer for people, then they won’t do it. I’m curious to know what other people do? How do you fit it in? Have you also found creative ways to pray and connect with the Divine? the One to whom I belong. This was actually written in February 2010 (before Rav School) and featured at another online location aka Facebook, so I thought I would also posted here. Jewish tradition states that Jews pray three times a day and recite 100 Berachot (blessings) a day; that’s a lot of praying. Actually it’s not that hard if you do all of the prescribed prayers plus do all of the blessings for just everyday occurrences such as food, washing hands, hearing good news, hearing bad news…etc etc. For me, this presents a challenge; can you imagine going from a zero prayer practice (except in shul) to praying 100 times a day? Impossible. So I’ve decided to start off small and just focus on one prayer at a time. I will probably never be so observant to prayer 100 times a day but I do hope that by adding a prayer practice into my life I will feel more connected to the larger world around me, be thankful for life’s blessings and hopefully feel more connected to G-d.
Modeh/Modah ani lifanecha melech chai v’kayam shehechezarta bi nishmahti b’chemlah, rabah emunatecha. I offer thanks to You, living and eternal king, for You have restored my soul within me; Your faithfulness is great. Modeh/Modah is said immediately upon rising before we get out of bed and should be the first words we utter every morning. When we recite Modeh/Modah Ani we are essentially thanking G-d for giving us another day. We wake up grateful instead of thinking about what may have happened the previous day and our first conscious thoughts are spent expressing, “thank you.” As someone who has had a rough time these last few months it’s nice to wake up and kind of remind myself to be thankful instead of thinking about the stuff that weighs me down. Basically if we wake up with a sentiment of gratitude, we feel grateful, and we can continue with a more positive day; if we don’t then we won’t.